Here's the press release, attached as a pdf, too. Bob I think you guys are a good example of what an active tea party should be and set a goal that the rest should strive for. We in the Peninsula Tea Party do some of the things you describe. For example Andy Maggard publishes "The Clarion" which has great articles contributed by numerous authors. He, Sue Long and some other members have regular letters to the editor of the Gazette-Journal and other newspapers. We recently distributed approximately 1000 flyers by five teams placing them in paper boxes throughout the county. In the future we may consider doing what you guys did by having them placed in our local paper instead. As you know, the Middlesex Tea Party and the Peninsula Patriots have joined together to form The Middle Peninsula Tea Party. The Middlesex group brought with it some great patriots like Trudy & Tom Feigum and provided us a great facility to hold our meetings (Middlesex Sports and Hunt Club). Ruth provides outstanding leadership and keeps us motivated. So I see the many tea parties across the country making great strides in changing the status quo. If this Republic is preserved, it will be through the efforts of these tea parties. We are privileged to be a part of that effort. Yes indeed the high traffic count in front of Wittmans Stafford office gave us a lot of exposure. 1. letters to the editor of local newspaper That section is the most widely read section of local newspapers and it helps CHANGE THE NARRATIVE in local discussion. The other side has controlled the NARRATIVE for so long many low information voters never hear our positions. One of our members up here has developed a team of :ghost writers" who's names the letters go out under so as to maximize the chances of getting published . 2 the signs---they have become a powerful tool. We attempt to re-message them frequently so people keep reading them and keep the topic relevant, tying it into what we are discussing at meetings. We name names and hit hard. Recently a member of the Hanover BOS who had allowed us to put up a sign on property he owned asked us to change a message because he didn't like us attacking one of his buddies in the General Assembly. I took the sign down. I will not allow any property owner to have editorial control over our messages and I make that clear up front before I put the sign up. 3 The Inserts ( I believe I had passed samples out at one of your meetings I spoke at last year ) In King William we hit 8,000 homes with these for around $850 in Mechanicsville we hit 29,000 homes for around $3100. Very effective because we stay focused on just 2 issues in each one, targeting the message to taxpayers and equally important--LOCAL LEGISLATORS. 5. Our 1 hour a month Volunteer Club. Too often one of our challenges has been getting people to help so we came up with this idea since it is very hard to refuse to give 1 hour a month. I have a few guys who paint the signs, it only takes 20-30 minutes to paint a sign so I can get two signs painted with each volunteer. I have two guys who change the flags, it is a small minor task but it keeps our flags on the signs fresh and takes it off my plate. We have the 2 Letter a month group, volunteers who comprise the ghost writers---who can't write 2 letters a month ?? By allowing them to just take bite size chores it keeps the work flow wasy. I have 1-2 guys who do the weed eating around the signs, everyone has just 1 small task so they are not having to commit whole days to TEA Party work. Seems to be working ! Thank you for your words of encouragement Bob. The signs you guys have put up have definitely made a difference. I have had a number of people tell me"you won't believe the yellow signs I have seen along the various highways". I tell them I know all about them and the guys who are trying to inform people. I am hoping to get a few more signs up here in Mathews and maybe I can get our Gloucester patriots to put some up in Gloucester as well where there is much more traffic. I checked with VDOT to see what the traffic count is at the intersection I chose to place my sign and found it to be around 2500 per day. That's not bad for a location out here in the boonies. Again, I thank you for your inspiration. I think we had about 12 people from the Peninsula Tea Party at the rally in Stafford. We were hoping to get more but over all I think the rally was a success. I have been beleaguered this past week by a few of the group leaders who are soft on Wittman. One in particular sent me a e-mail link showing that back in 2010 Wittman finally signed on to Duncan Hunters bill H.R 337 attempting to derail the repeal of Don't ask Don't tell , which as you know would allow open homosexuals to serve in the U.S military. I offered to send this gentleman the newspaper article from a week after we met with Wittman and his refusal to sign onto Hunters bill. It appears Wittman did and he did it on APRIL 17TH 2010 some two full months after we met with him and after he had refused to at our meeting. CONRESSMAN WITTMAN---WHY ARE YOU NOT PROTECTING OUT MILITARY ? He felt so much heat from the pressure he finally relented and signed onto H.R 337......but only after we pounded the snot out of him. One of the local newspapers came up and took pictures of the sign and ran it on their front page the following week. These signs are very useful tools Lonnie, try and get the others down there to get busy and get as many as possible constructed. God Bless You for your efforts. Remember all of these signs we have in King William, King & Queen, Hanover and now Henrico county have tens of thousands of cars drive by and read them daily ! They work. This is my yellow sign which was inspired by yours. Hope to see you at the rally Monday. Even if you can't actually go to the open house, you can write a check or send your contribution via Eventbrite to let EW know how strongly we feel about his candidacy. This is a chance to show the Republican Party of Virginia that EW is the kind of man we want to see on our ballot! Only our donation$ will impre$$ them, but you and I know that our prayers and our testimonies are effective in supporting his candidacy. Talking to your neighbors, your relatives, and the folks in line at Wal-Mart are effective too! Don't give up! Don't give in! Don't let up! How about we get our telephone message system keyed up to let people know we need to support this fundraiser for EW? I will be embarrassed and disappointed if we don't raise $10,000 next week! We can do it! ¡Si, se puede! The other opportunity, you may know is 1st CD Republican Fundraiser: The 3 Rivers Rally and Pig Roast on 4 - 6 PM on Sept 22 at Historic Rosegill Plantation, St. Hwy 227, Urbanna, VA 23175 but don't wait.! Religion is not mere window dressing; citizenship is not a spectator sport. Do not allow our common destiny as a whole people to just happen. The Patriot movement is comprised of two distinct factions that are fracturing. One side continues to cling to the misguided notion that so long as we elect someone with an R next to their name we are winning ? I have cited numerous times in the past the hollow lie that notion contains. Republicans have run Virginia for the last 4 years…….need I say more. The other side ( or faction ) understands very clearly what must be done. John Taylor said the truth, and if we understand and accept that, then a hard line, albeit with short term political losses must be endured in order to further the bigger goal. Here comes the "Bob, this election is too important" or " we gotta win" ( win just what--another 6 billion dollar tax increase ? ) and last but not least my personal favorite "Well Bob, our guy isn't as bad as their guy" Winning isn't the goal. Resolving the problems is the goal---we mustn't lose sight of that. We must reform the republican party, and the soft ball approach many of you advocate, at times for perhaps your own self serving reasons has not worked. Smarten up, toughen up, or step out of the way…please. The people listed below do not stand for the principles of the Republican Creed. They betrayed us and they don't deserve our votes. Every one of these names deserves to lose their seat. Patriots - we can't stop now! We must get the message to Eric Cantor. Let's get a group going on this. Please let me know! Start planning now. This is a MAXIMUM EFFORT EVENT! 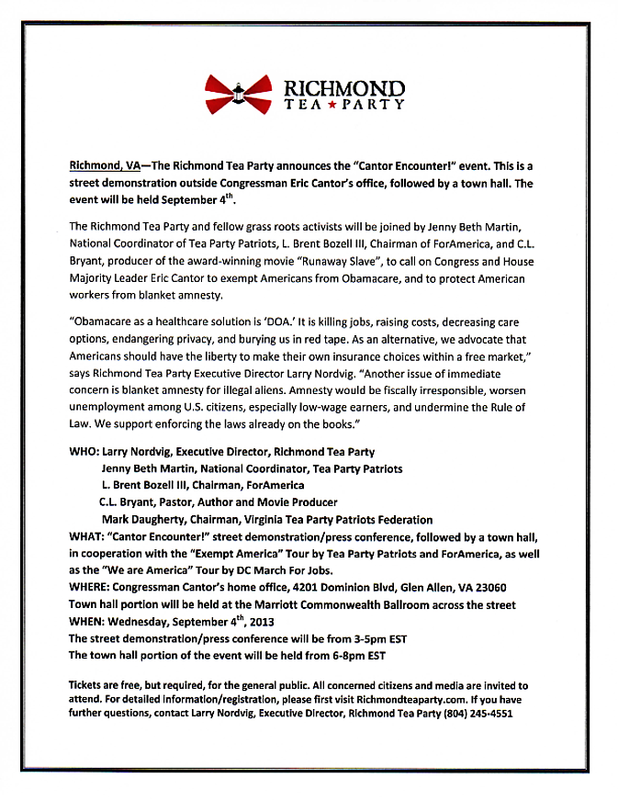 We need ALL Patriots and Concerned Citizens in Virginia & beyond to attend! DEFUND OBAMACARE & vote NO AMNESTY! We cannot afford to lose on either of these issues, or our Nation could be Lost! Come! And FIGHT for your Country! YOU may speak also, as time permits! Tell Cantor EXACTLY what you demand of your Representative! You MUST sign up for Tickets! They are FREE, but space is limited! SEE YOU September 4th, 3pm, in Front of Cantor's Glen Allen Va Office! A Flyer for The Event is Attached--Forward it & Post it! We have GOT to WIN this fight!! This is a very important rally. Please try to go. A Rallying Cry for Rep. Rob Wittman to LISTEN! Disappointed in his "RINO" Voting Record and Silence on Current DC Scandals? His Position on Stopping Amnesty, Defunding Obamacare, Cutting Spending, and many more Vital Issues?? Join the Protest Demonstration of 1st Congressional District Groups and Send HIM a Message — Bring Your Signs! Buses Available @ Wal-Mart in Tappahannock. This is an important message from Bob Shannon. Too busy isn't a reason, it is just an excuse . In February of this year a meeting took place in Tappahannock among leaders from the Patriot/TEA Party groups that make up the 1st Congressional District. The stated purpose was to form a 1st Congressional TEA Party Alliance. The goal was to speak with 1 voice, giving perhaps some clarity to the issues and the leverage we hoped to gain by doing so. It was held on a Saturday when each of us had any number of EXCUSES to not attend. Each of us there that day have jobs, families and other commitments ourselves. That said we met and a plan was formed starting with a series of meetings with various public officials to first see if we could be effective by delivering our concerns in the normal political process. That has born little fruit, as I expected. Elected officials today ,with few exceptions are beholden to either party establishments with their own agendas or by the donors who in essence finance their political ambitions so long as THEIR INTERESTS are advanced. Any politicians constituents are an after thought ,at best. That must change. The Patriot movement has learned a few things after 4 years. One of the most valuable lessons has been in learning how to use the media effectively. Much of that credit must go to Robert Bruce, known affectionately as "Sarge" up here in the hinterlands. His "force multiplier" platform has been honed and we are using it with increasing effect and efficiency. That is where the PROTEST comes into the picture. Couple the letters to the editor campaign with the road side TEA Party signs, the press releases appearing regularly in the local newspapers, the Inserts and protests, and you begin to see a game plan fall into place. Add to all 4 of these measures the knowledge we have acquired of how to use the media effectively and you can see the game plan falling into place. That said it still takes numbers for these protests to do what they are intended to do. How many of you reading this have not been to a meeting in months, or years ? Just what do you expect ? Do you think sitting around your house complaining is the answer ? Do you think you are contributing by putting a bumper sticker on your car ? Are you comfortable allowing others to carry the load ? Glen Beck ( and I am not a Glen Beck fanatic) said a few weeks ago that the Patriot movement is so close to succeeding, so close to purging the republican party of the rino's ---he urged all of us to not quit now. You can see the evidence of our success at the local level, the turnover in elective offices the last election cycle---IT IS WORKING. It is time now to ratchet up the pressure on the state and congressional representatives. Next Monday I am hoping you join us in the fight that all of us should be waging. Buses are being arranged to pick up at the Wal-Mart in Tappahannock or you can drive yourself. Congressman Wittman ,along with most other elected officials have been watching and hoping the Patriot movement just burns itself out. Will they get what they have long hoped for ? Who ultimately depends on you ! Patriots: An invitation to meet E.W. Jackson from our members Dave & Sarah. Please open the attachment and see the note below. Each of you is cordially invited to our home on Saturday September 7 at 6:30 PM for a Meet and Greet/Fundraiser for E.W. Jackson, our Republican Candidate for Lieutenant Governor. The attached invitation is self-explanatory. Please us it to preregister and pledge your donation. If there are questions please call us at 804-695-9897 or 804-832-2196. You can mark me down as attending Ruth. Thanks for the reminder. Patriots - more details on the Wittman Rally on August 26th. Bus info will be posted separately. If you ever wanted Rob Wittman to listen to you and change the way he has been voting, --and especially starting in September with Congress convening - now is the time to STAND AND BE COUNTED. We have put together a "rallying cry" to let him know we are not happy with his voting record. The leadership of all of the entire TPs of the First Congressional District have tried countless times to get him to listen to no avail. So this is the last effort before Congress convenes on Sept 9th and ALL TPs in his District are going to rally. PLEASE STAND WITH US on August 26th at 10 am in front of his HQ in Stafford. Please see the attachments for details. They are (1) a 2-sided flyer (including his egregious record and what we expect going forward in September and beyond - including a link to an on-line petition to get his attention) and (2) an actual 2-sided PETITION for those to print off and get signatures and bring to the rally or mail to him asap. Print and use these as you see fit. Pass them to anyone - neighbors, friends, relatives, etc. Education is the key to understanding our frustration and intention to push very hard to get his attention. We are in the end game - in overtime....and he is on the bench waiting on Boehner to call the shots. THIS IS THE LAST OPPORTUNITY.....to make your voice heard. If you don't participate and send a loud and clear message, we can expect that he will cave to Boehner, as always (check his record) and NOT defund Obamacare in September and a host of other issues. This is a critical time and we need ALL hands on deck. Because the "rallying cry" is in Stafford (about 2.5 hrs away), his "safe" HQ, we are going to rent a bus or more to help get us there - to the door step...no walking, no driving.....at $35 per person- bring your signs, water, lunch - whatever. See the info (attached) if you prefer to drive (address details, etc attached.) I am counting on my Tea Party Patriots of the Middle Peninsula. All Tea Parties and Concerned Citizens of the Mid-Pen are participating. I have been hard at work with our First Congressional Tea Party Alliance....and all are activated and ready to attend because we have tried for years to no avail. We need hundreds to get his attention. Bring a friend or relative. Pressure is about the numbers. Don't assume others will come - YOU must be there - please. YOUR voice is important! We are going to give this BIG PR. I need to know and hear from you if you are coming. I know it is short notice but please make it a priority. More coming on the bus details - I will post it separately so you can RSVP. Let me know if you want to ride the bus asap. I'll rent as many as possible. We are hoping York, Essex and King William folks will hop aboard via Rt 17 stops. PS - I've also attached some ideas for signs just to get you thinking! Be sure you indicate your COUNTY - he needs to see we are from all over his voting district. We want - always - to remain respectful - we are patriots.